Slated to be a PS4 launch title in Japan, DriveClub has been delayed and won't make its planned February 22 release in Japan. The reason for the delay? Website Inside Games quotes the press release as saying, "Various circumstances." The game's release date is now TBA for Japan and will be announced at a later date. Note that the game's release date was "early 2014" for the West, so this could just be Japan being slow about the first delay? 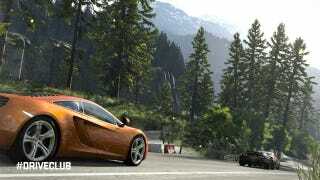 DriveClub was originally supposed to be a launch game for the PS4 when it went on sale in the West. The game, however, was delayed at that time until this year. "DriveClub will be a truly innovative, socially connected racing game," Sony's Shuhei Yoshida wrote last fall, "but the team requires more time in order to deliver on their vision—and I'm fully confident the game will surpass your expectations." No word about how the game's PS4 launch delay for Japan impacts its global release.